The “year of living on the edge” continues. While I’m dealing with Ernie’s “transition” (Charlestown-speak) to the care center (and breaking down in the process), I had an occasion to celebrate. Ara, you may remember, is my Nigerian friend. She’s been in America as long as we have lived at Charlestown, and she works here. In 2009, we both participated in the Charlestown mini-triathlon. In January 2010 Ara, her boyfriend, and two sisters took me to a movie theater to see Avatar. It was my first time in a movie theater in 20 years. And to see Avatar in 3-D! What an experience. In fact, when I said the experience had been too overwhelming and I wanted to see the film again, they took me a second time. Since Ara and Yemi had already seen Avatar twice, this gave 12-year-old sister Ebun a chance to see the film a second time, too. Ara and Yemi saw another film. So much fun doing that with Ebun. Last spring Ara and I were teammates in the mini-triathlon, and Ara won the gold medal as fastest runner. 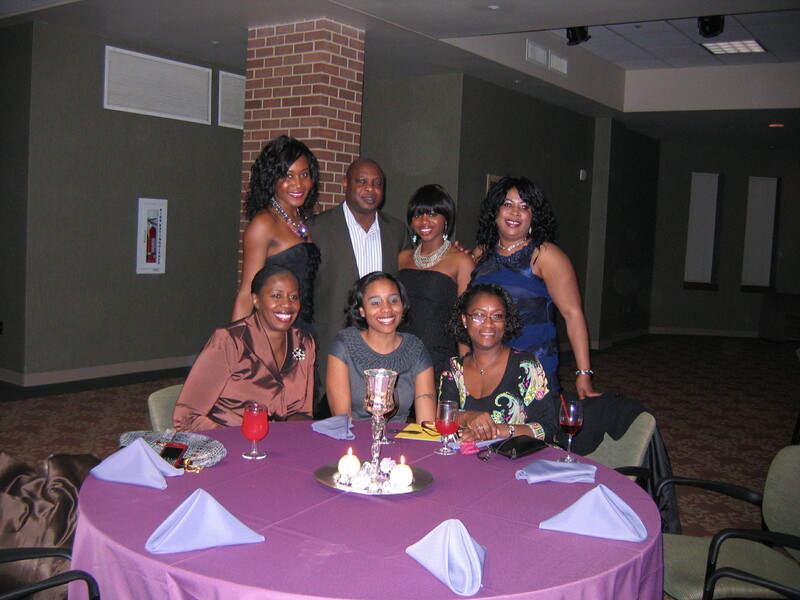 The invitation was to celebrate three special events–Ara’s graduation from nursing school, her 23rd birthday, and her sister Ola’s 21st birthday. Ara already has a baccalaureate degree, and she aims for a doctorate in nursing. Last week she became licensed as an R.N. so we were celebrating that, too. Of course, I signed it. 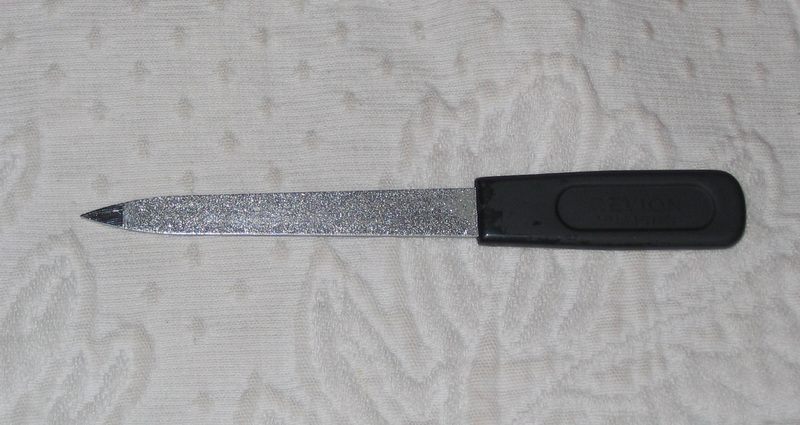 And I added the edging after this scan. I finished it at 3:30 Saturday afternoon–just in time! Not only am I not good at piecing. I am even worse at edging. 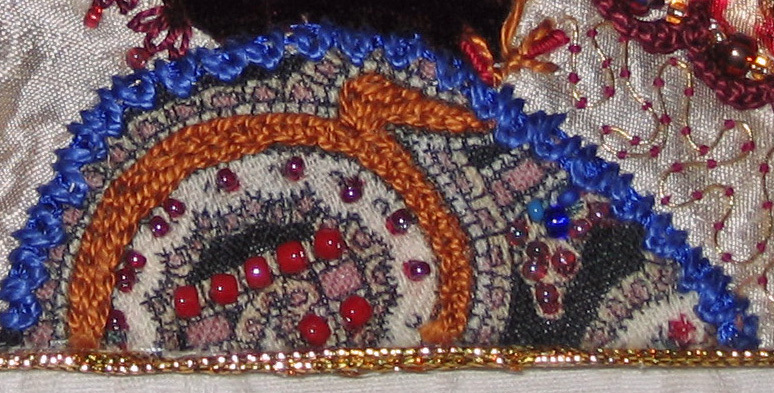 I have repeatedly put heavy stitching or beads too close to the edge, making it very difficult to finish. 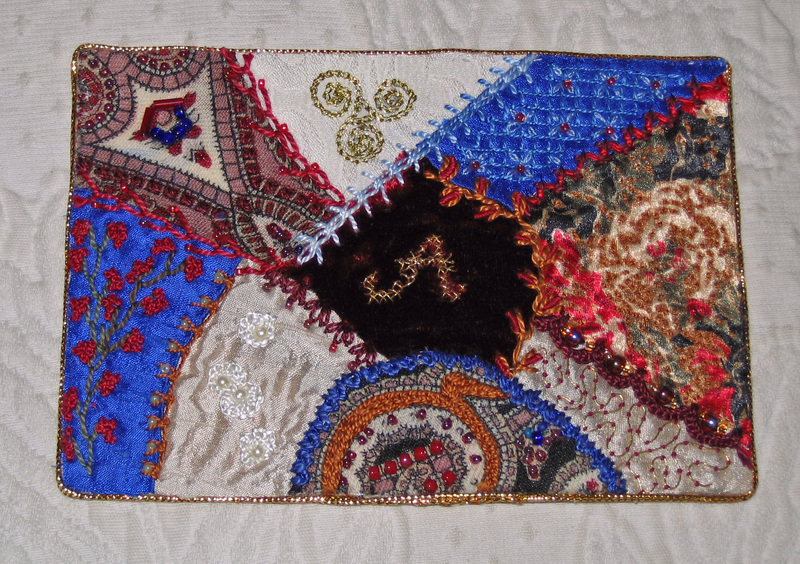 For Ara’s card, which was too stiff and resistant for me to stitch through, I added three rows of gold Raj cord. to painstakingly apply narrow strips of glue to the edge of the card. It took three hours. 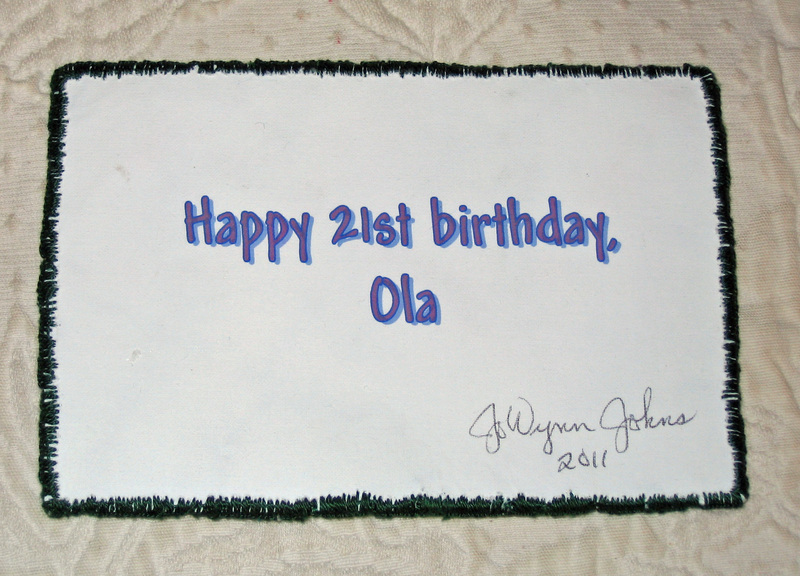 For the edge of Ola’s card, which had lighter backing, I thought I might be able to do machine stitching. I made myself a practice piece with the same materials and tried it. With more practice, I might have been able to do it. 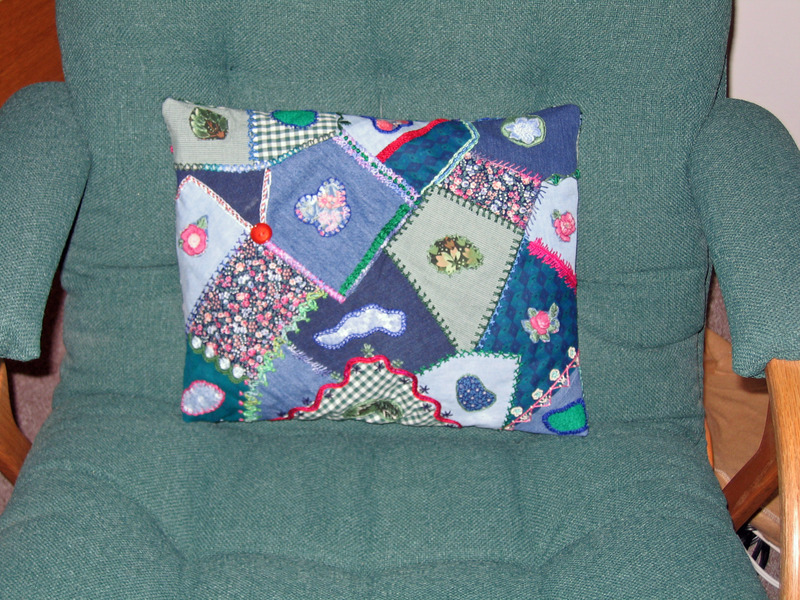 I also tested hand stitching at the bottom and I could do that. 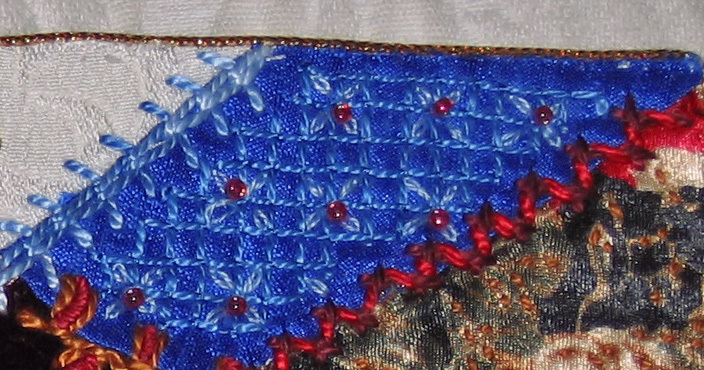 But I couldn’t use the sewing machine because after I cut the card to size, there were beads too close to the edge. 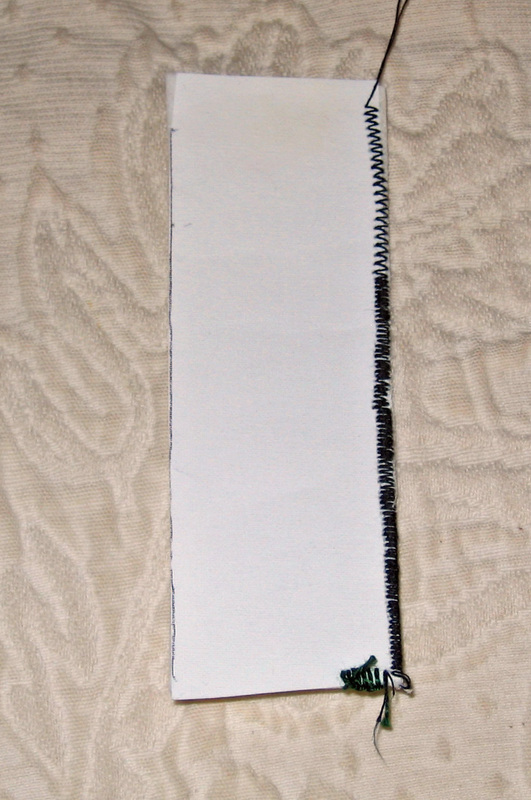 This is how I buttonhole stitched the edge. It took four hours. I have friends who can machine-stitch the edge of a fabric card in a minute or two. If there’s a quick, easy, simple way to do something, I am incapable of it. If it’s slow, hard, tedious, and time-consuming, I go for it. 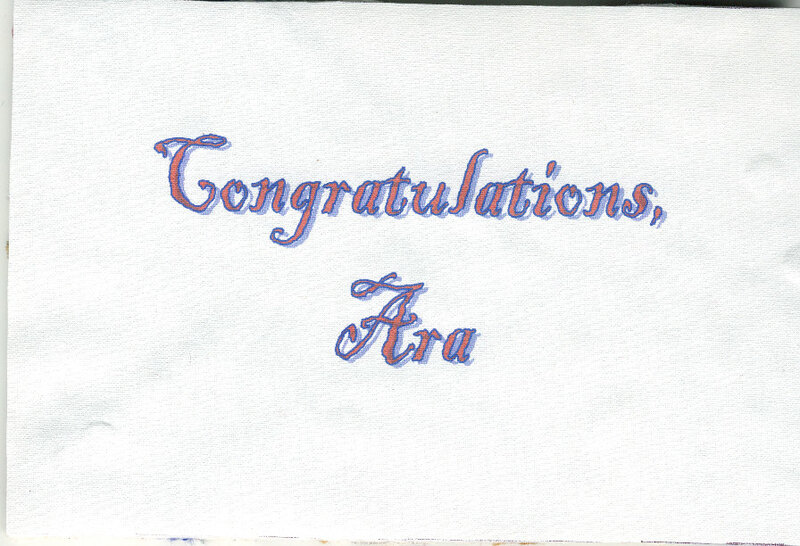 Here are some details of Ara’s card. 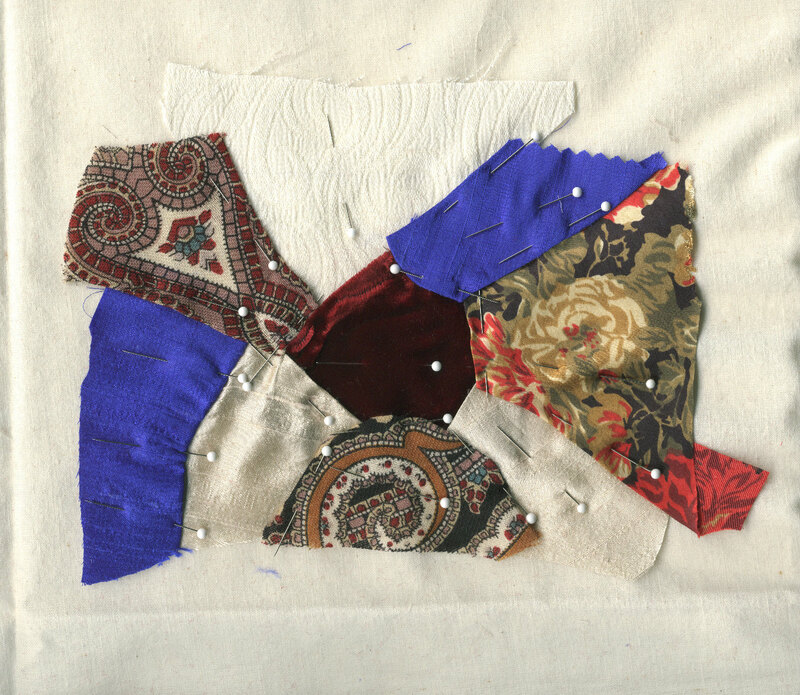 A grid made using waste canvas. While I was working on these cards, Ernie had two brain attacks and admission to the care center became urgent. I was a wreck, and by Friday I was very sick with severe cold/flu symptoms. On Saturday I had laryngitis and couldn’t speak. 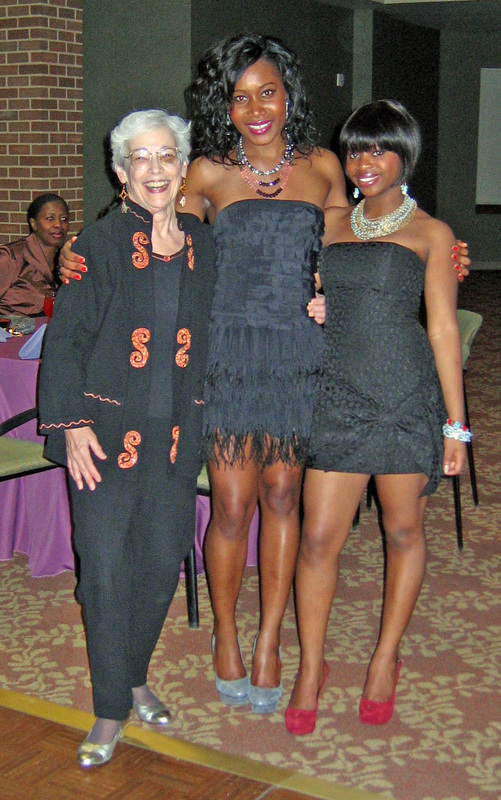 But I was determined to show up at the gala and present the cards to Ara and Ola. Of course I was going to go. This was my first opportunity to wear my black jacket and the earrings Nina made for me to wear with it. Never mind the black eye. More stress, I guess. Doesn’t hurt. I arrived early for the party. Ara and Ola with some other early guests. This was definitely a party for their friends. No other 73-year-old great-grandmothers there! Me with Ara and Ola. I managed to stay long enough to dance a little, then home to bed. Sorry I missed the real partying. I feel honored to have been included among Ara’s and Ola’s friends. 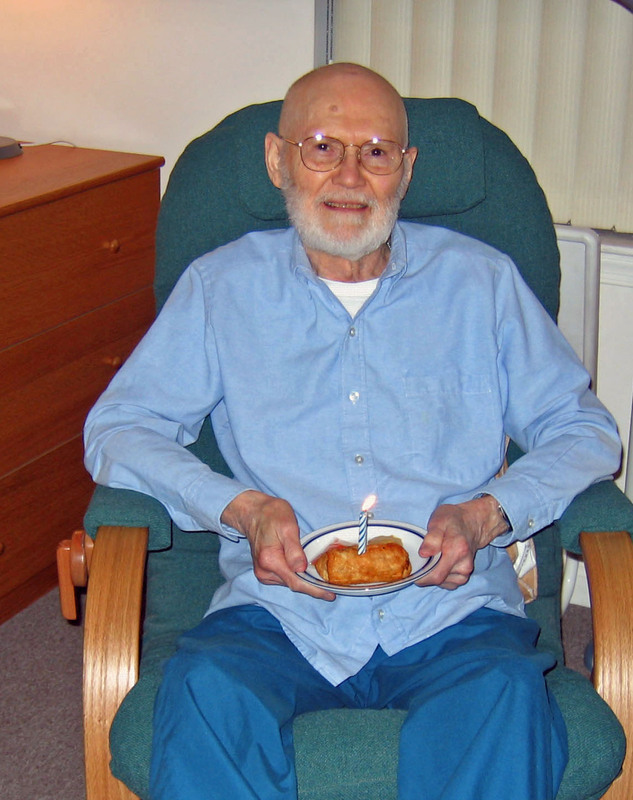 In 2009 we had our last birthday party, when Ernie turned 84. We ordered Chinese delivered and I put a candle in his egg roll. With it, he had his favorite premium bourbon, Maker’s Mark. In February he will be 86. Two days ago he fell–no harm done. A little seizure, I suppose. After a few minutes on the floor with a pillow under his head, he was able to get up (with my help) and get to his bed. His walker probably kept him from falling hard. Since then he’s been more tired and dazed. Because he’s always been asleep when I go to practice the piano and swim or walk between 5:30 and 8:00, I haven’t taken my phone. This morning I got back home to find him having a seizure. He had tried to call me and couldn’t get me. He was afraid, not knowing where I was and what might happen. Never again. 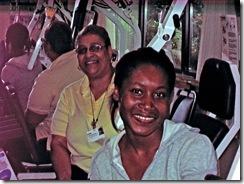 I have not begun the transition process to assisted living a moment too soon. I want to be able to manage this, not have an emergency move. 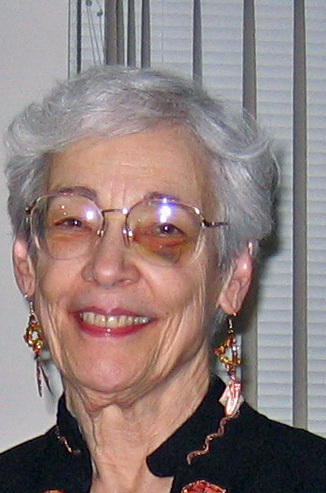 If you follow my blog, you know that 2010 brought many new, exciting, and enjoyable activities and events into my life. I got a driver’s license and bought a car. I drove to the beach and went swimming in the bay. I spent a weekend at my son’s and his wife’s lake house. I ran a 5K race. I’m practicing the piano 90 minutes each morning (don’t think I’ve mentioned that). I partied at the gala and at the Halloween wedding. There have been many very satisfying experiences. At the same time, I have been living in a highly agitated, over-active state. My explosive recovery in 2009 left me too energetic, in an ADHD condition, unable to settle down, almost manic. Meanwhile, as I worked on calming myself down this past year, Ernie has been experiencing significant decline and increasingly frequent brain attacks. 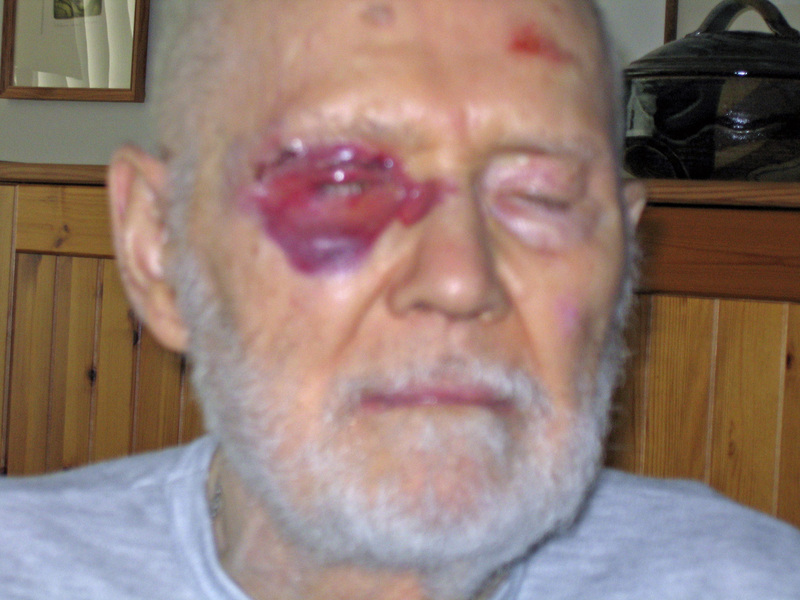 In a brain attack in April he had his first fall, as he staggered toward his bed before I could prevent him. That meant a trip to the ER and 11 stitches to close the wound. In 2010 he had 17 brain attacks, during which I must sit beside him to prevent him from falling while he is out of his mind. He tries repeatedly to stand, and he can’t. He’s confused and disoriented and usually aphasic. Each attack leaves him weaker and less cognitively functional. On June 27th, after five attacks in a week, he was back in the ER. This time they thought he was dying and he was admitted to the hospital for palliative care only. But a few days later, he began eating. I had been fully prepared for his death and not prepared for ongoing more of the same. My manic phase became almost constant tremulousness when I am at home, and sometimes when I’m doing something scary for the first time, like driving to the airport to meet arriving family. Especially at home, where I am most of the time, I’ve been extremely nervous and wound up tight. During November and December Ernie had six brain attacks and I began to feel on the edge of hysteria, all the time. My hands tremble visibly and when I talk to people, I stammer and stutter. I began to fear that, under the stress, I might succumb to ME-CFS again. I knew I was breaking down. The problem is that Ernie is relatively self-sufficient when he is not in an attack. I don’t need any help and I can leave him at home alone. Anyhow, there’s no one who can come immediately while he’s having an attack, except Charlestown’s Emergency Medical Services. All they can do is take him to the ER, which we agreed not to do again. There is no treatment. There’s nothing anyone else can do here. Only I know how to manage him. Since the attacks are completely unpredictable, no pattern, I can’t schedule help if I wanted to. In desperation, two weeks ago I made an appointment with our social worker. She said, “You can’t handle this. He has to go to the care center (nursing home).” I visit at the care center three days a week, and have been doing so since February 2009. I know how bad it is to live there. Then I saw my doctor. She prescribed alprazolam to calm me down. She also said Ernie would have to go to the care center. At that prospect, I was feeling even sicker. But what would happen to Ernie if I collapsed? Wow! 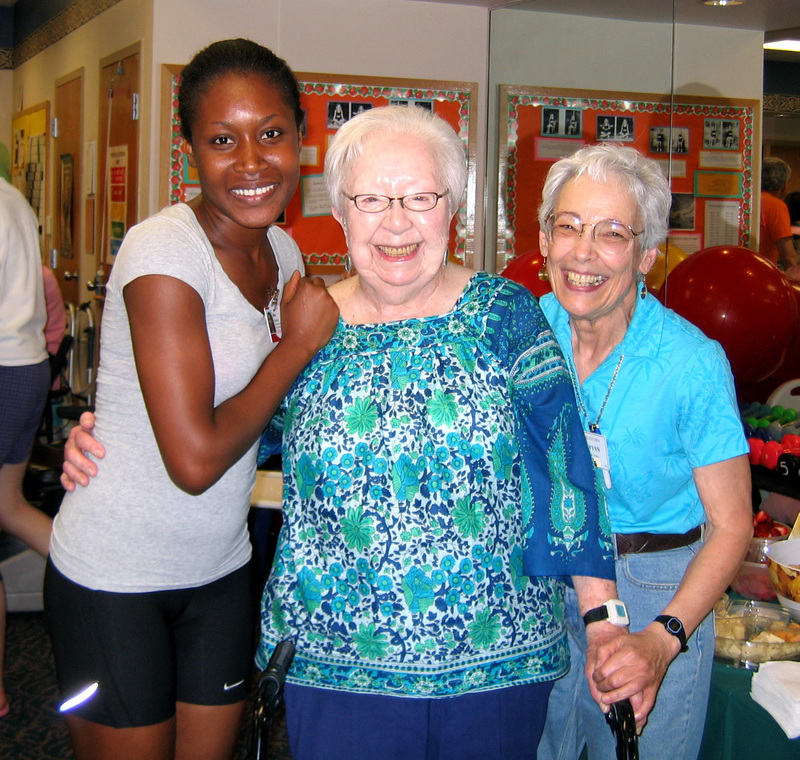 There’s a huge difference in the quality of life possible at assisted living as compared with the care center. He can maintain more of his normal routine, have much more autonomy; and when he’s having an attack, a staff person will be sitting with him. We (Ernie and I are doing this together) are in the process of “transitioning” him from our apartment to a studio apartment in assisted living. I don’t know how long this process will take. Already, though, I am less “nervous”, not trembling as much, and feeling enormous relief that he will not be in the care center. At least for now. So all the while that I have been having fun and adventures in 2010, at the same time I’ve been having a really hard time. Joan Didion wrote of the year after her husband died immediately of a heart attack, that it was The Year of Magical Thinking. Queen Elizabeth II spoke of her “annus horribilous” a few years ago. In 2010 I had a year of living on the edge. 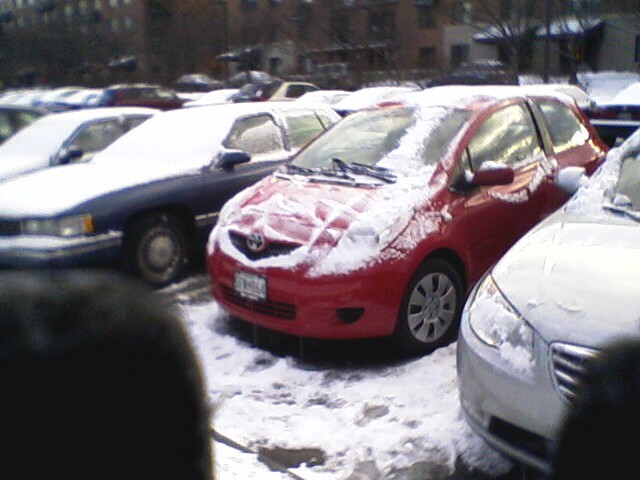 Another first for me–clearing snow and ice from my car. Haven’t done that since I lived in Boulder, Colorado in the 1980s. The last time I owned a car, we had a garage, in 1992. 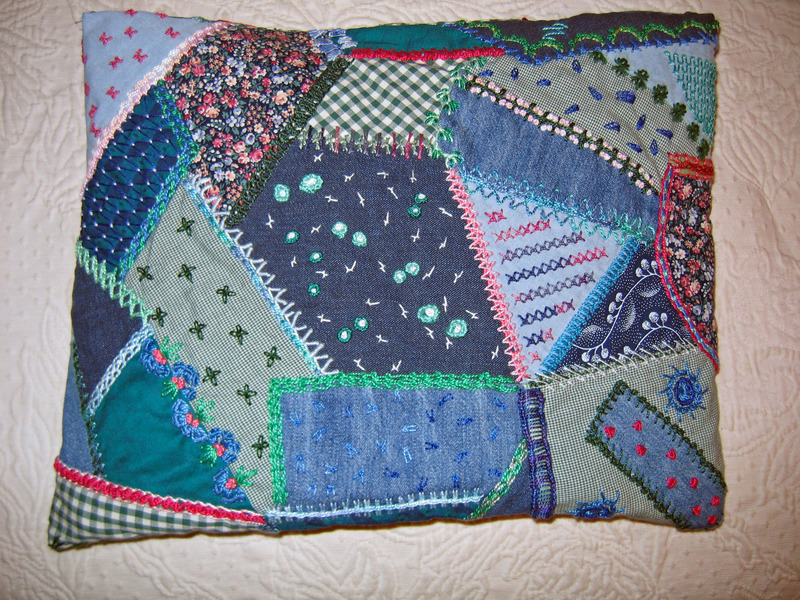 This piecing for the second fabric card I’m making took about an hour and a half, maybe less. No design. I just cut and pinned patches before hand basting them. 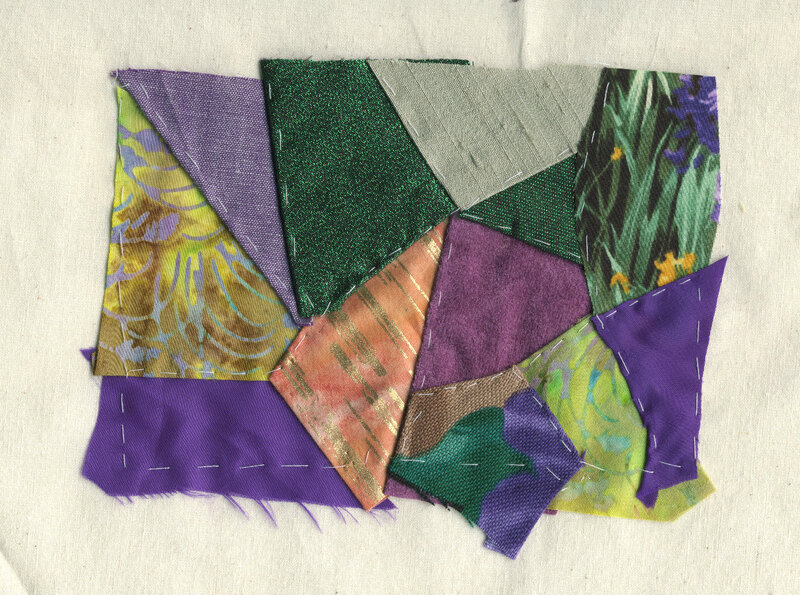 It will be interesting to see how these two crazy patchwork pieces turn out. 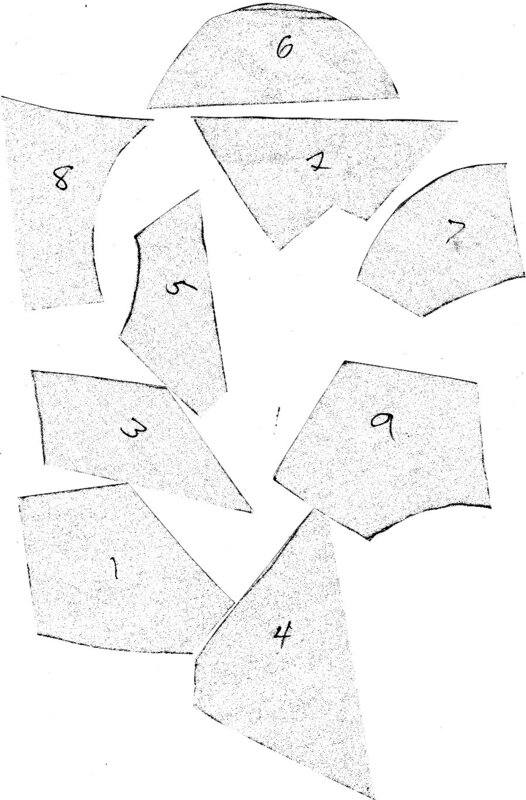 I am not good at piecing. You know that. I do know how to machine piece. I know the stitch and flip method. I just haven’t done it enough to become skilled at it. It’s difficult. Further, I’m usually not satisfied with the unplanned results I get. Having been invited to a party to celebrate the 21st birthday of one young woman and the college graduation of her sister, I wanted to make gifts for them. But I didn’t want to spend a lot of time, so fabric cards came to mind. This is also something I’m not good at. 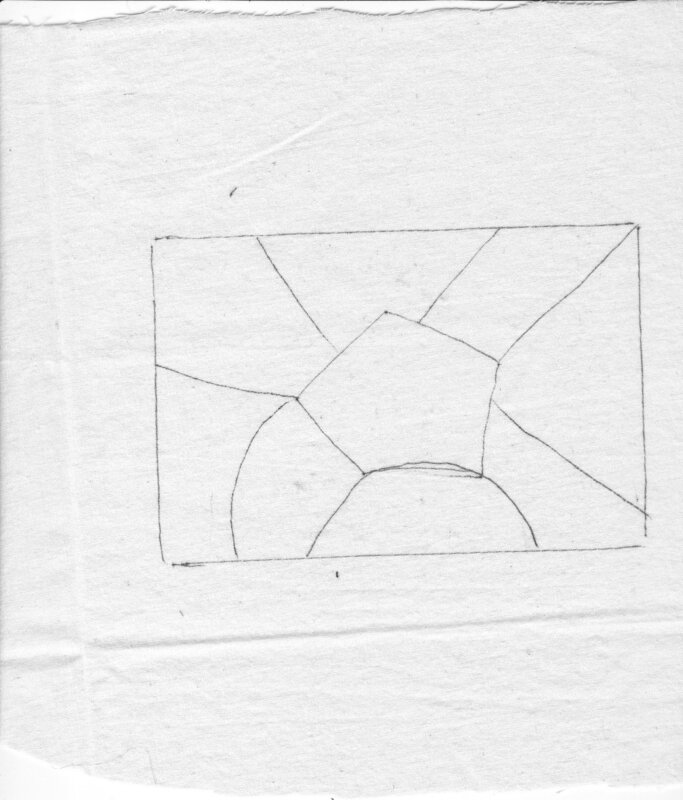 After choosing fabrics and trying to arrange some patches on the backing fabric, I gave up and drew a design on the muslin. I cut patches with about 3/8 inch seam allowances and pinned them to the foundation. 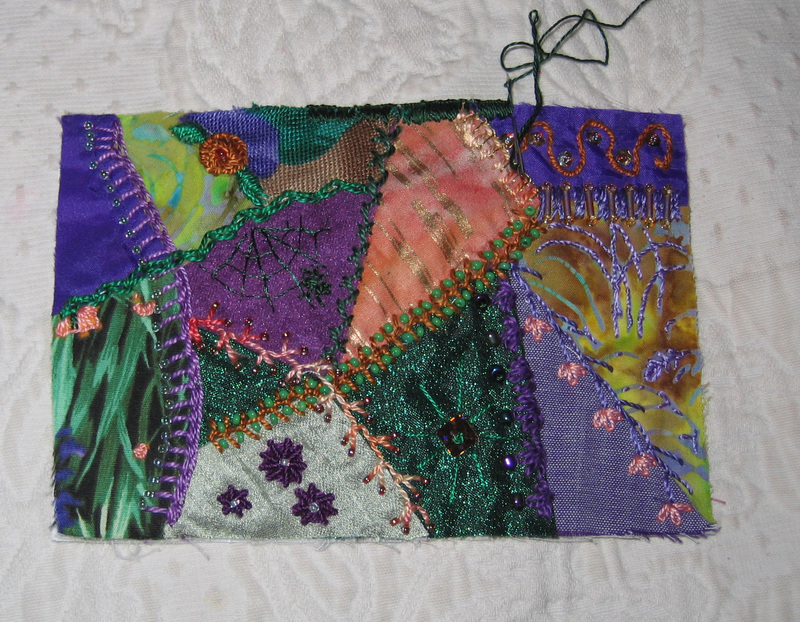 Silk and silky patches, hard to manage, very fiddly, tedious work. It only took four hours. It shouldn’t be this hard! But I do get interesting shaped patches. 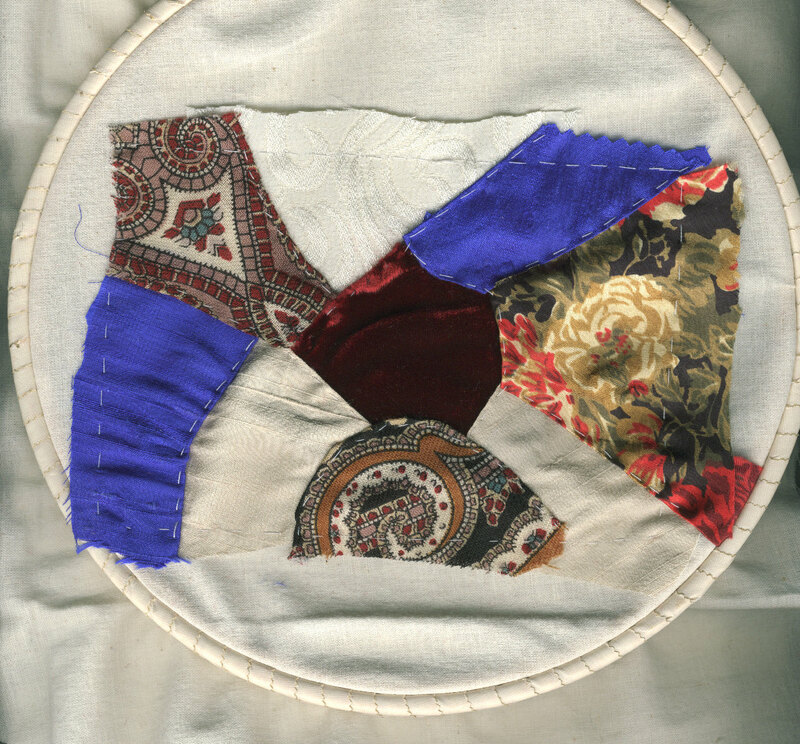 When I decided to stop adding stitches, I got out my sewing machine and joined the two sides. 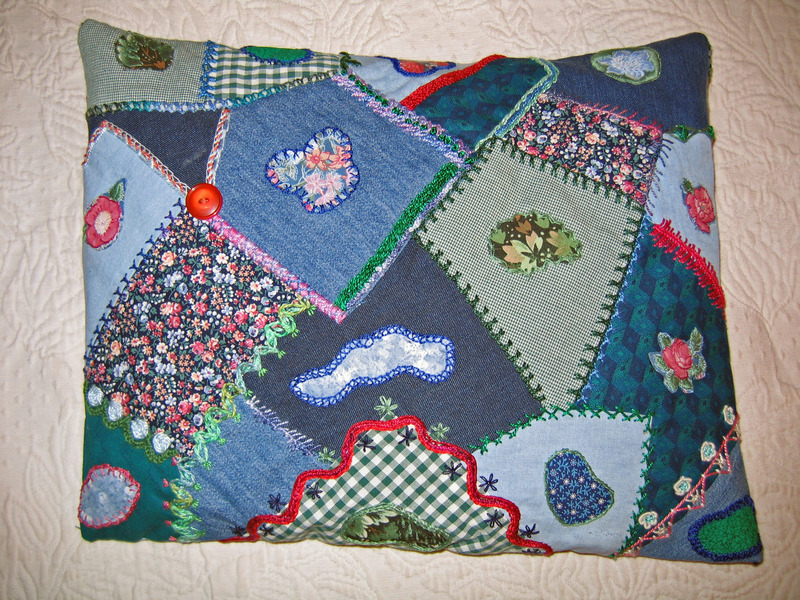 Then I put the little homemade pillow inside and closed the remaining side with invisible hand stitching. 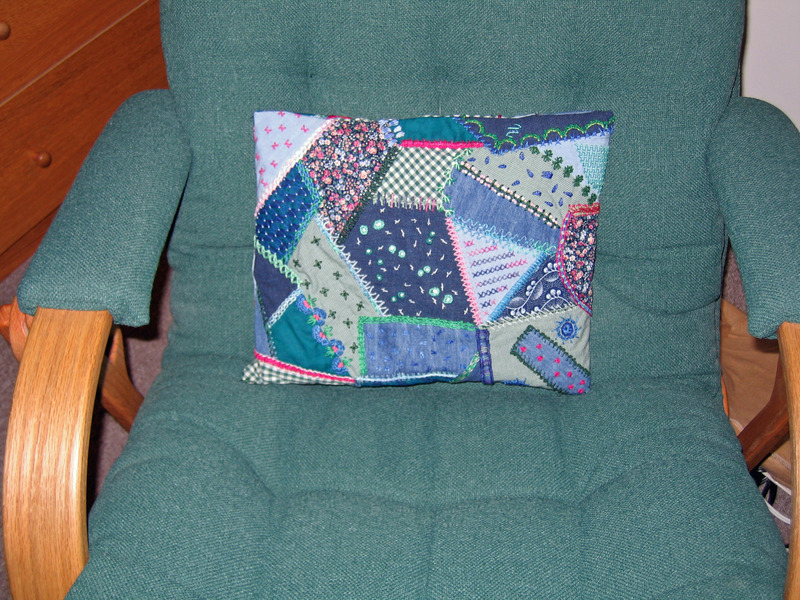 As it looks in Ernie’s recliner: the side with only TAST stitches as seam treatments and patch embellishments. 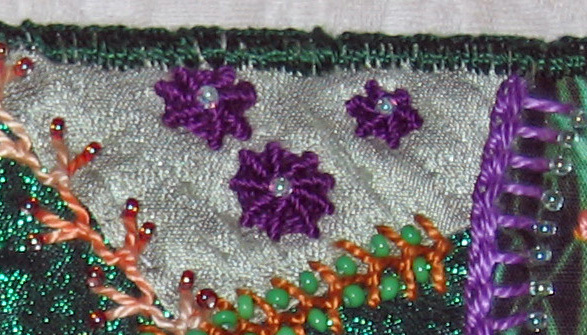 The side with TAST seam treatments, appliques, and TAST stitches on and around the appliques. I added some small refinements before stopping, and I thought a lot about the gingham. 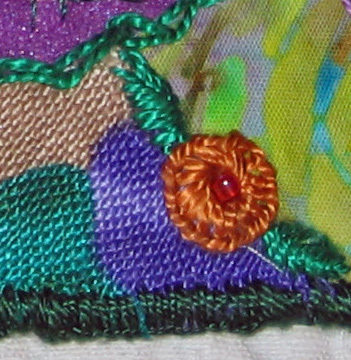 It cried out for some stitching, but I couldn’t think of a TAST stitch I wanted to use that I hadn’t already used nearby. The pictures at Flickr are better, but I can’t get Flickr to blog them here. 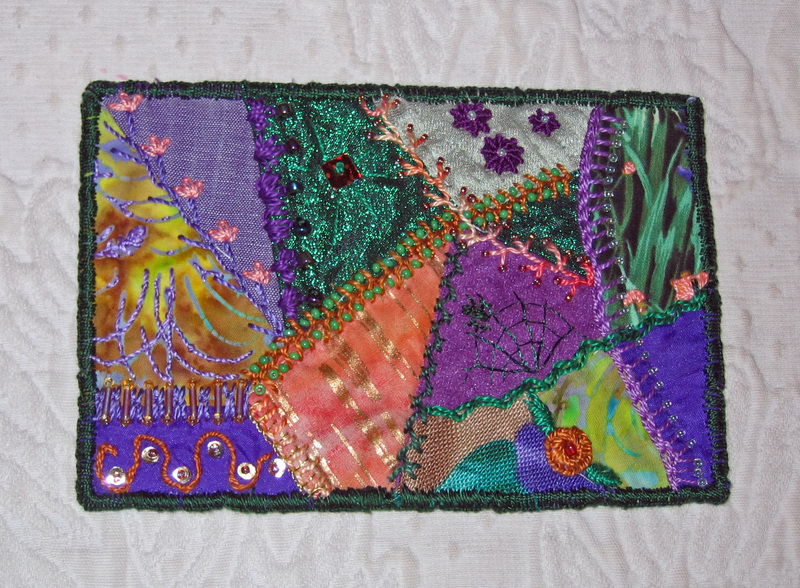 There is one TAST 2010 stitch missing–beaded hedebo, because I didn’t want to use any beads on this pillow.